It’s that time of year again, there’s a chill in the air and the mornings require a little something extra to help warm you up. 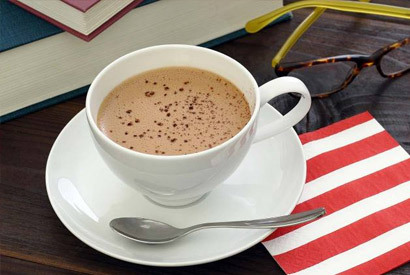 If you’re looking for a healthier spin on a yummy holiday drink, try this simple peppermint mocha recipe! 1. Make the shot of espresso or strong coffee. 2. Warm the coconut or almond milk. 3. Add the coffee and milk to a blender along with the cacao powder, honey and peppermint. 4. Blend for 15-30 seconds until mixed and foamy (you can also just stir everything together for the froth-free version). 5. Top with chocolate shavings or crushed cacao nib sprinkles if desired. Yield: Makes about 30 small pieces of candy. 1. Melt half of the chocolate over low heat, stirring constantly. 2. Spoon into molds, filling only about 1/3 full. 3. Refridgerate mold tray for about 10m minutes, or until chocolate is solid. 4. While you’re waiting, mix the crystallized honey and peppermint together. 5. remove mold tray form fridge and spoon about a 1/4 tsp of the honey/peppermint mixture. Keep it centered and away from the mold edges if possible. 6. 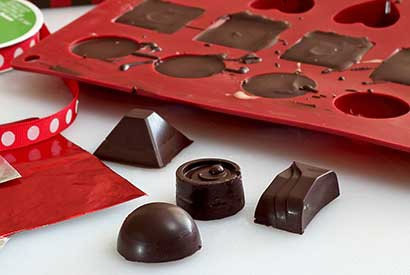 Melt remaining chocolate over low heat and pour over the molds to fill completely. 7. Refrigerate mold tray for about an hour. 8. Pop your candies out and enjoy! Recipes are courtesy of www.paleonewbie.com, visit the website for more delicious and healthy recipes!